Juicing For Weight Loss: 5 Detox Juice Cleanse Recipes To Try At Home! I’ve put together a list of my 5 all time favorite juice cleanse recipes that will take your detox juice cleanse to new heights! These recipes are easy to make at home, and they’re packed with nourishing vitamins and minerals. Most importantly, they’re refreshing and delicious which makes juicing for weight loss seem like more of a treat than an actual diet! If you’re considering trying a juice cleanse, one of the main reasons is probably to lose weight. But when it comes to juicing for weight loss, there’s a lot of unfounded marketing claims and misleading information out there, it can be hard to figure out what’s actually true. Luckily, the science is finally out on juice cleansing. Let’s take a look at what it has to say about doing a detox juice cleanse. The short answer is yes. 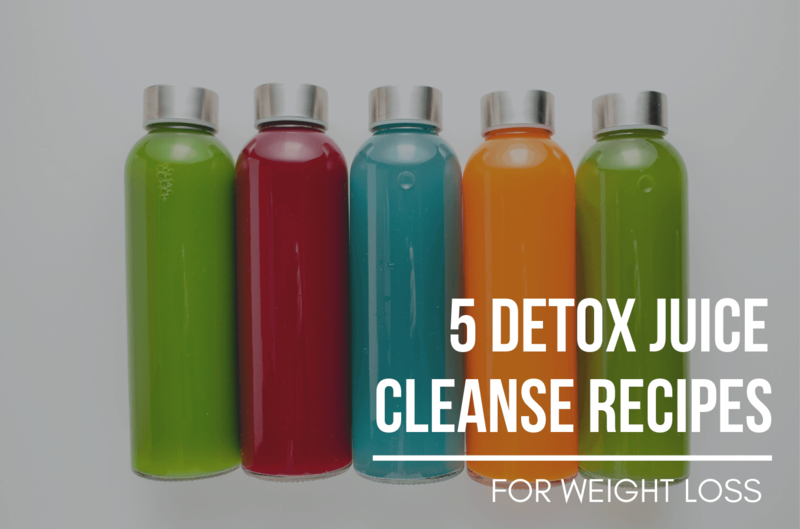 Doing a juice cleanse can be an excellent way to lose a few extra pounds. In fact, a UCLA study found that participants lost an average of 3.75 lbs during a 3 day juice cleanse! The weight didn’t just come right back after the juice cleanse either. Participants were still on average 2.2 lbs lighter when measured 14 days after the cleanse. It’s important to pick the right juice cleanse recipes though. Juices that are high in fruit and low in vegetables can lead to a spike in blood sugar and tend to be higher in calories. Lemon and ginger are great ways to improve the flavor (and shelf life) of a juice without adding too many high sugar fruits! How do you lose weight on a juice cleanse? Calorie Deficit: Juices made from primarily vegetables are very low in calories. During a juice cleanse you will be consuming fewer calories than your body is burning each day. This creates a calorie deficit which results in weight loss. Is a 3 day juice cleanse good for you? So juicing is great for weight loss, but is a juice cleanse actually good for you? The same UCLA study from above found that a 3 day juice cleanse gave some pretty awesome benefits. But before you get started, it’s very important that you know how to do a juice cleanse the right way. Proper preparation will maximize the benefits and eliminate unwanted side effects during a juice cleanse. You definitely don’t need to buy a bunch of expensive cold-pressed juices to do a juice cleanse. You can make your own juices at home for a fraction of the cost. All you need is a powerful blender or a juicer! Green Goddess is a vibrant and refreshing green juice full of nourishing vitamins, minerals, and antioxidants. This is the ultimate green juice recipe with all the fresh green veggies you could think of. This juice is the perfect way to start your mornings during a juice cleanse because the flood of vitamins and minerals give you a rush of clean energy! Orange Glow is a light and refreshing carrot juice that tastes like bottled sunshine (yes that’s actually a flavor trust me)! This juice is full of revitalizing and skin nourishing nutrients like beta-carotene that will give you naturally glowing skin! This juice recipe is the perfect blender-friendly juice. If you don’t mind a little pulp then it’s not even necessary to strain this juice through a nut milk bag after blending. Blue Mermaid Lemonade is the perfect summer refresher! It tastes just like lemonade, but has a vibrant aquamarine color and powerful anti-inflammatory properties thanks to blue spirulina. Every juice cleanse needs a good lemon water or lemonade recipe. This lemonade is boosted with the “superfood” spirulina to help take your juice cleanse to the next level. Spirulina is one of the most nutrient dense foods on the planet. It is also rich in antioxidants and anti-inflammatory compounds, primarily due to the blue pigment-protein called phycocyanin! Ageless Aloe is a refreshing, hydrating, and anti-aging aloe vera juice cleanse recipe with cucumber, lemon, and ginger. Cooling cucumber is the perfect pair for hydrating and nourishing aloe vera. Not only is this juice the most refreshing on the list, but it’s great for ageless skin. Cucumber and aloe vera’s hydrating properties are perfect for skin nourishment, but aloe vera juice has also been shown to promote youthful skin. Replenish, refresh, and re-energize with this thirst quenching Watermelon Beet Energy Juice! The watermelon, lime, and mint flavor combo on this juice is invigorating. This juice is the perfect afternoon juice cleanse recipe for when you’re starting to feel low on energy. It’s packed with revitalizing vitamins and minerals that will have you re-energized in no time. The beets in this juice also provide a healthy dose of natural nitric oxide, a common pre-workout supplement for it’s endurance and stamina boosting qualities. Don’t have a juicer but still want to try these homemade juice cleanse recipes? All you need is a powerful blender and a nut milk bag! Blend the ingredients for each recipe along with 1-1.5 cups of water. Pour the blended mixture into a nut milk bag and squeeze to press the juice out. This technique is much faster and easier to clean up than using a juicer. Why buy multiple expensive kitchen gadgets when all you need is one? My vitamix blender acts as my blender, juicer, and food processor all in one! Here’s a detailed guide on my 5 favorite high quality blenders for a variety of price ranges! Too busy to make your own? Let’s face it, even with the blender technique, juicing at home is a time consuming process, especially during a juice cleanse where you need 5-6 16 oz juices per day. It only gets worse when you take into consideration the shelf life of pressed juices. Fresh juices only last 2-3 days, even in an airtight glass container stored in a cold and dark fridge. That means prepping ahead of time isn’t really an option. If you want to do a juice cleanse but don’t have the time to juice yourself, then I recommend the 3 day juice cleanse from Jus By Julie. They have tons of delicious flavors to choose from and they ship nationwide. You can even take your cleanse to the next level with booster shots or detox soups! Wash and dry all fresh produce. Add ingredients to a blender or juicer. If blending, add 1-1.5 cups of water to each juice. If blending, use a nut milk bag to strain out the pulp. Consume 5-6 16 oz juices each day. I recommend starting the day with the green goddess juice, and having the watermelon beet juice as your mid-afternoon juice when you feel low on energy. I find 3 day cleanses to be my favorite length, but a 1 day cleanse is great for beginners. Never go longer than a 7 day cleanse. For more information see my guide on how to prepare and do a juice cleanse. Definitely going to give these recipes a try. Want to lose a few lbs before my friends wedding in two weeks and these look so yummy!